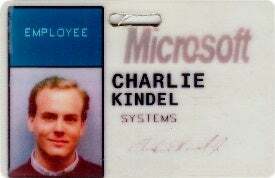 Microsoft veteran and Windows Phone Manager Charlie Kindel announced Monday he would be leaving Microsoft after 21 years to start a new company. "I'm not yet ready to disclose details about the new venture but I can say I will be staying in the Seattle area to build it," he said on his personal blog. "It has to do with sports, advertising, mobile, social-networking, and, of course, the cloud. I'm insanely excited to get started." His blog post included a long "goodbye" e-mail message he sent to coworkers that highlights some of his favorite moments, achievements, and people at Microsoft. He continues to build up Windows Phone even as the operating system faces an uncertain future as it loses popularity with consumers. "To the Windows Phone team: I may stop using some Microsoft products now that I'm out of here. But not Windows Phone. The BEST product Microsoft has ever built. Do not let up!" he says in the e-mail. Kindel told Geek Wire that there's never a good time to leave a post but that an opportunity came up for him to create a startup and he decided it was time for him to move on. If you're wondering how a soon-to-be former Microsoft employee's feelings are towards Google, it's pretty much the same as that of current employees. Kindel adds: "To my kids: No, just because I don't work at Microsoft anymore you many not use Google. Remember, every time you use Google, a puppy dies."